Týniště nad Orlicí will commemorate the legendary Queen. 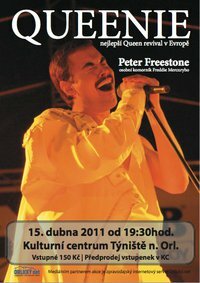 The memorial evening will be attended by Freddie Mercury's personal assistant Peter Freestone. We have met Peter before, and we look forward to seeing him again. In addition to Peter's talk and Queenie's show, there will be the screening of a short film from Montreux in Switzerland, where Queen spent a lot of time and where they recorded their last albums. The annual meeting of Queen fans from all over the world also takes place in Montreux – Queenie performed there as the headliner in 2008. Link to the Facebook event here.